The Mosquito is a 16ft Australian cat design, which was created by Neil Fowler in 1966. This was only months before the Tornado was designed and the similarity in hull shape design is apparent. It was originally designed as a cat rigged single-hander, but a jib and a second trapeze were added so the Mosquito could also be sailed two-up. Until the 80's plywood construction techniques were used, but these days most new boats are of foam/glass/kevlar/carbon construction. Mosquitos are raced in Australia and South Africa. The Mosquito's rig is low-aspect compared to modern cats, but is actually very efficient. The Mosquito is competitive with other cat classes in everything from a drifter to survival conditions. Since 2000 the spinnaker has become a standard addition in South Africa and is becoming more widely used in Australia. Anyone is allowed to build Mosquitos. In Australia all the new boats are currently being made by Jim Boyer at AHPC. Jim produced a lot of Mosquitos back in the 90's and, after a 10 year break, is now back in production with a mold shaped by Russell Denholm, which has proven to be the best hull shape ever for a Mosquito. Mosquitos have been numbered from day one, and we are now up to 1800. The majority of these will have rotted away in backyards by now, so the actual number in existence we can only guess at. Maybe 300 to 500. The Mosquito is a dispensated class under the F16 rules. It is actually too light to fit the F16 rules but because the rig size and platform width are well under the maximums allowed, the Mosquito is accepted in Open F16 Events. In practice we can be very annoying to the real F16s but have to get very lucky to beat them. Last edited by RickWhite; 07/30/15 01:00 PM. Anyone is allowed to build Mosquitos. Over the last few years, there has been a steady run of new foam-sandwich boats being built from the mould shaped by Russell Denholm, which has proven to be the best hull shape so far for a Mosquito. Home builders have also been building and sailing their own plywood Mosquitoes. I have raced laser for some time and just discovered the Mosquito. A few questions: What is the ideal weight to race a Mozzie? What is the enjoyable/raceable wind range? How does it handle waves? How does it compare to the Taipan 4.9? Is it good also to use Mosquito? what are their differences to the others? Same question! Would someone let us know? the mosquito is a great boat!! basically a 16 foot version of the tornado, still running a standard (non-square top) rig. designed to be built inexpensively. can be sailed cat or sloop rig. it wont carry the crew weight that a taipan 4.9 does. best sailed with an adult or adult with a small teenager up front!!! again a great little boat!! A Class 585 "FHARKEN A"
BUT YOU CAN ROLL IT IN GLITTER!!!!! The Mosquito was designed in 1966 by Neil Fowler of Darwin as a one person (on trapeze) cat rigged yacht. Later the jib and the second trapeze were added and the Mosquito became an easily converted one-person/two-person yacht able to be built at home by the amateur or by professional builders but not restricted to one manufacturer. At first the Mosquito gained acceptance in Darwin and South Australia in MkII mode (two person sloop rig) while in Victoria the one person MkI (cat rig) dominated. Soon after it also became established in NSW, Qld and Tasmania. There are also Mosquitos sailing in South Africa and even Canada (we know of one!). Although it can be loaded up with an esky for a day cruise (on a quiet day) it doesn't suit the cruising role; the Mosquito is a racing catamaran. 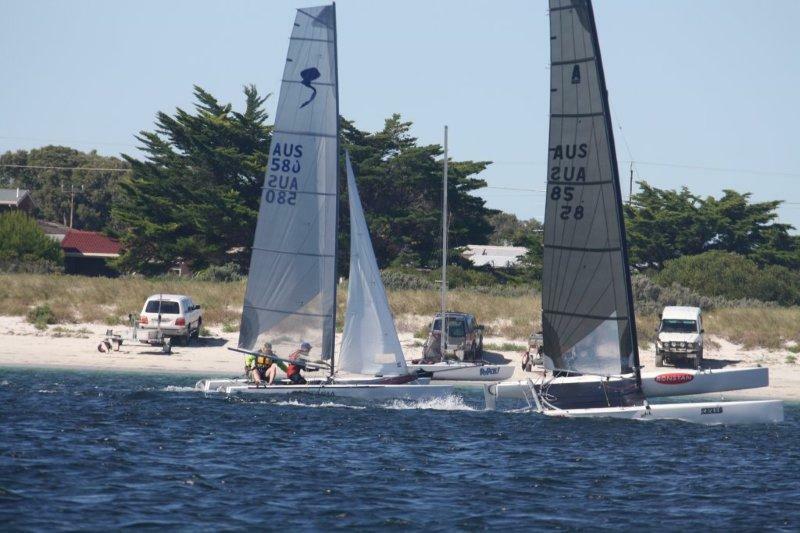 The Mosquito has been around now since the the late 1960s and in that time its performance has been shown to be consistently good for a 5 metre catamaran, often beating much newer designs around the course. The current YV yardstick is 84 for both MkI and MkII. While it is fast the Mosquito is not loaded up with excessive sail area. Instead it achieves its performance through efficiency and light weight. The Mosquito has a very low minimum weight; 55 kg for the bare hulls or less than 80 kg fully rigged. It is very easily handled on the beach from trailer to water and back again. The Mosquito is not as wide as most 5m cats at 2.185m. Combined with the light weight this make it a fairly lively and exciting boat to sail. When it was introduced it was criticised for having a tall, high aspect rig which the "ordinary" sailor would never be able to handle. Times change and these days the Mosquito's once tall mast could be regarded as a little shorter than the average. The Mosquito is easily converted from MkI to MkII and although not all skippers take advantage of this some find it convenient to keep a jib and a pair of cleats in the car for when the family want to join in the fun. MkII skippers can easily remove the jib if they want to sail and the crew can't make it. The Mosquito can be bought as a complete set of hulls (in fibreglass or timber) for owner finishing but many prefer to sharpen up the plane and saw and create their own. The Mosquito is built from ply using the stitch and glue method. Timber frames are used at the pickup points for the main and rear crossbeams and at the forestay chainplate points. Foam frames stiffen the rest of the hulls. Many builders add extra foam frames as they weigh little for the amount of stiffness added. Timber hulled boats are finished in two pot paints or varnish. The class rules are structured so the amateur builder can conform without too much trouble and so that although the boat is basically one design owners can individualise their boats with variations in hull internals, rudders, deck layout, fittings and rigging. Click to see full size imageThe Mosquito has a lot to offer; performance, light weight, resale value, good competition and an active class association plus the ability to change between a one person and two person boat without losing performance. For more information contact one of the State Associations or NMCC officials. Contact details are available from our contacts page. You can also download an information brochure in PDF format. Last edited by Pirate; 06/12/13 04:22 AM. Talking of forgotten mozzies, if anyone knows of a decent one forgotten in a shed, could they please contact the association. There is a huge demand for 2nd hand mosquitos at the moment, and if we can't facilitate the demand we run the risk of losing sailors to other classes. I know of two people in my club alone who are interested in getting into a mozzie. I reckon your post might have meen missed because it is in the 'about' topic. Start a new topic and you will probably get some responses. Neil Folwer past away last year, He is the father of the Mosquito class among others. Neil Fowler was one of the founding members of The Darwin Sailing Club, established in 1963. Neil brought with him a Quickcat � a 16 ft Australian catamaran designed in 1957 by Lindsay Cunningham. It�s worth remembering that the first modern beach cat, the Shearwater, first appeared in the UK in 1956, so Quickcats were also among the very first. They had double-ended dory hulls connected by a rather complex wooden structure which supported the mast, a central centre-board, a hiking plank, and a small plywood bridge deck. Neil had sold the Quickcat by the time I arrived in Darwin, and was designing and building his own catamarans: the 18ft Arafura and the 11 ft. Arafura Cadet. The Arafura and the Cadet were similar in concept: Both had dory hulls, a plywood bridge deck, and a central swing-up centerboard. Neil sold Cadets in kit form, and possibly also the Arafura as well. One of the Rum Jungle exploration team, geophysicist John Ashley, had built a Cadet, and I decided I wanted one too. So in the wet season, when field-work was over for the year, I bought a kit from Neil and set about assembling the boat. Those were the days of Resorcinol glue and polyester resin, and although epoxy existed, it was not generally available. Unlike epoxy, resorcinol is not gap-filling, my carpentry was far from perfect, and so the boat leaked somewhat at the chines. It had a wooden mast, made of two halves which Neil hollowed out with his router and then glued together, and the rig comprised a main and a jib, with a total area of 75 square ft, or 7 square meters. It cost me a couple of hundred dollars to build, and was light enough for me to be able to load it onto the roof of the VW by myself. At some point the centerboard broke off, and as it didn�t seem to make much difference, I never got around to making another one. Although I never raced, I had a lot of fun on Darwin Harbor with that boat, and it taught me the basics of sailing. I remember it being extremely well balanced, and I could steer hands-off by shifting my weight fore and aft. Darwin has big tides, and one day I left the boat rigged up on the beach, with an incoming tide, while I went home for something or other. When I came back, the tide was up and the boat gone. I persuaded someone to take me out in a power boat, and found the catamaran a couple of miles out, sailing quietly towards Indonesia. Meanwhile, Neil was designing other catamarans, and the Arafura Arrow appeared in 1964. This was a 14 ft boat, which filled a gap between the little Cadet and the 18 ft Arafura. In 1965, he designed the Minx, also 14 ft, but different in concept to the Arrow: it had very buoyant V-bottomed hulls, and raised side-side decks, making the bridge deck a kind of rudimentary ****. It could probably carry three or even four people and was more of a cruising boat than the Arrow, which was designed for one or two. Neil organized evening classes where he showed people how to build Minxes, and I built a pair of hulls, but moved back to Sydney before I could finish the boat. (I sold them to a geologist friend, John Shields, who completed the boat and raced it). Neil always seemed to have some new catamaran in progress in his garage, but the Arafura, Arafura Cadet, Arrow and Minx are the boats I knew at the time. He went on to design the Mosquito in 1966 after I had left. Mosquitos were among the first of the �second generation� beach cats, with round-bottom developed ply hulls, twin dagger boards, aluminum cross beams, and a trampoline. Then came the Black Witch, which I believe was a scaled-up Mosquito, and the 20 ft Wirraway, which was a micro cruiser with a small cabin, commercially produced as the Red Baron. After leaving Darwin, I returned to Sydney, hooked on catamaran sailing. I bought a 12 ft Kitty cat, which is a snub-nosed New Zealand boat with an alarming amount of sail for its size, including a spinnaker. According to one account, the designer had noticed that the rules governing 12 ft skiff racing had nothing to say about the number of hulls permitted, and the Kitty was supposed to blow these dinghies out of the water, although I can�t vouch for this story. It was certainly a handful at times, and was the only catamaran I ever raced. In fact, in a mixed fleet of various dinghies I found myself in the lead and might have won if I had known where the next mark was. My next catamaran was a Solo 16, which I built in the early 1970s. I can�t for the life of me remember the designer�s name, except that he was from Adelaide, and the boat has disappeared without trace from internet sources. The Solo had Quickcat ancestry, with similar dory hulls but there the resemblance stopped: It had twin dagger boards instead of a central centerboard, and the heavy wooden structure connecting the hulls was replaced by aluminum beams and a trampoline. The mast was supported by twin forestays, so there was no headsail. It had a hiking plank, and was quite fast, especially single-handed. Hiking out on the plank it was easy to fly a hull, but the boat always felt under control and never looked like nose-diving. I had a few capsizes and breakages, but the boat was easy to right, even when fully inverted. The Solo seemed to me to be a much better boat than the Hobie 16, which had appeared in vast numbers by then. I sometimes wonder why the Solo never became more popular. Maybe it was eclipsed by the second generation of catamarans with stitch-and-glue construction and more sophisticated hull shapes. I moved away from catamaran sailing for many years after the 1970s, although I owned several monohulls, and restored a classic 28 ft Laurent Giles yacht. But a few years ago, now living in Lima, I built a 14 ft Pixie beach cat, which is a Richard Woods design, and I still sail it. The current project, almost complete, is a Strike 16 trimaran, also by Richard Woods, and the next one will be a 10 ft trimaran designed by John Marples, which I hope can be used by disabled people. I will never be bored as long as I can build and sail these boats. Neil was one of the pioneers of Australian catamaran development. In the 1960s, There were a few other catamarans around including Attungas and Yvonnes as well as the Quickcats, but Neil�s designs were the ones that caught on, first in Darwin and then throughout Australia, and hundreds were built. Cadets and Arrows, modernized in the 1970s with trampolines and aluminum beams, are still being built and raced in Australia today under the auspices of the National Arafura and Arrow Association, which has branches in Queensland, New South Wales, Victoria and South Australia. Mosquitos are still sailed in those states as well. Neil�s influence made Darwin one of the premier catamaran-sailing centers in Australia in the 1960s, through his designs, boat-building classes and encouragement. He died in 2006 aged 84. I once posted on a popular catamaran forum asking if anyone had heard of Neil Fowler. No-one had. This seems a shame to me because Neil was one of the pioneers who influenced the early development of small catamarans in Australia along with the better-known names from England and the USA. I was lucky to be living in Darwin at the time when he was designing and building those boats fifty years ago. Everyone who sails a beach cat today owes something to those early designers and builders of the 1950s and 1960s. Are you able to clarify the position of the forestay chainplate? Mine is on the outside of the hull but I notice everyone else has them on the inside. Also do you have any suggestions on the best way of sealing the beams onto the hull and well as inspection hatches? I have quite a few leaks. The Forestay should be on the inside of the hulls. The Measurement should be on the building rules on the website... www.theracingcat.com. On glass boats we don't seal the beams on the hulls. On timber just a tiny bit around where the bolts going through. Makes it difficult if you want to de-beam them overtime. Seal the hatches with marine Sika 291. No need for screws either.